Goodness knows my projects always benefit from another pass with a competent pair of eyes. They often get one during proofreading, and it’s humbling to see the things I missed or flubbed. In the end I’m glad for the sake of the book that the errors were caught before they made it into print. But when readers are misguided and aggressive, I can’t help but resent the time it takes to undo their work and justify my own editing to the writer. I know this happens to copyeditors all the time. One young freelancer wrote to me in a panic: an author whose work she had edited had given the final copy to a friend, who had found many “errors and incompetencies,” and as a result the author proposed paying only half the freelancer’s fee. The author had attached a list of alleged transgressions, which the freelancer forwarded to me. The problem was, almost nothing on the list was an actual error. “Please see the attached document with my friend’s tracked changes,” wrote the author. “There are more then 30 corrections, and while some of them are small things like extra or missing commas, there are major grammar mistakes such as: (a) curriculums (must be curricula—there is no English word curriculums, as he pointed to me) (b) the nominee’s students’ works (must be the nominee’s students’ work) . . . ,” and on it went. I myself have been the victim of second readings twice recently. In each case, there was a long list of “errors,” some of which were—I’m not too fancy to admit—errors. But the majority of my so-called mistakes were not. Rather, these readers wanted to add hyphens where they weren’t needed (two years old, a quarter century, thickly treed), change correctly broken words at the ends of lines (qua-druple, geog-raphy), and uppercase words against our house style (president, army). It was clear that the after-readers were not experienced or trained editors. They knew little about copyediting conventions, much less Chicago style. Frequently they marked a change in one place and failed to notice that for consistency they should have marked it throughout. And yet they didn’t doubt for a minute (and the author was quick to believe) that they knew better than the copyeditor. —You’re entitled, and it’s a good idea. No copyeditor is going to catch every last error in your work. —Realize that although your reader may have three PhDs, that doesn’t mean she knows whether your publisher capitalizes the queen or spells out thirty-seven. —Sending your copyeditor another list of errors will cost her time (= money), and it isn’t fair to send a lot of bogus errors you didn’t vet. So . . .
—Look over your reader’s list of errors carefully and check them against the style sheet your copyeditor sent you, and if possible, against the recommended dictionary or style manual. At the very least, check them against whatever dictionary you have at hand. —If your reader flags a change to something you know appears more than once in your work, find the other locations and add them to the list. —Although you may feel defensive, don’t blame the writer, who only wants the best result possible. —If the second reader and the writer favor a change that doesn’t wreak havoc, swallow your pride and go with it. —Resist the temptation to respond to every item on the list with reasons and arguments. Instead, apologize for errors, explain that other issues are a matter of house style, and reject only the corrections you feel you must. —If you are forced to defend yourself to a supervisor, welcome the review of your work. Remember that it speaks for itself, and don’t freak out with a barrage of explanations. —Make a habit of sending the writer a copy of your style sheet, and include mention of the dictionary and style manual you follow. Sending the author a copy of the style sheet is excellent advice that I always follow when working directly with an author. Surprisingly, though, when the client is a publishing house and not the author, the publisher's staff members often neglect to send a copy of the style sheet along to the author. That omission always complicates things. I had an author once tell me that he had several editor friends look at his book that I had edited, and they had unanimously agreed that "no one uses serial commas." I spent over an hour on the phone explaining that no, we would not be re-editing the entire manuscript to take the serial commas out, along with all the other parts of our house style he didn't like. 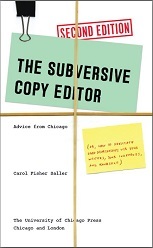 (I also suggested that, if he was interested in BOOK editing, he should check out the Chicago Manual....) As a freelancer, I rarely take on book editing projects anymore, because I dealt with very few authors who truly appreciated editing. Most others acted like, in removing the errors and inconsistencies, I had ruined their work. I've had an almost opposite problem. In the final stages of a book edit, the author has had friends read it who told him, "It's perfect the way it is." I was still not satisfied with the way certain passages were written. But since "everyone else was OK with it," I had a hard time getting the author to finish polishing his work. When I learned that there are other, correct ways to edit a single piece (not just my way), I felt a great sense of professional maturity. There are style guides and style sheets, to be sure, but editing is largely an art. There are many correct versions. The advice we give authors about taking their edits professionally goes double for editors. Carol's advice in this post is grand. And I 100% agree that it is very aggravating when inexperienced laymen are given more credit for their (editorial) opinion than is given to a seasoned professional. I'm somewhat relieved that even the best of us experience this second-guessing. I have found that when I work directly with authors, many don't care about style. If they have a question, I let them know that books of this sort follow CMS and that CMS recommends that we do it this particular way. That is usually a good enough answer for the authors.